The approximate solution of ill-posed problems by the regularization method always involves the issue of estimating the error. It is a common practice to use uniform bounds on the whole class of well-posedness in terms of the modulus of continuity of the inverse operator on this class. Local error bounds, which are also called error bounds at a point, have been studied much less. Since the solution of a real-life ill-posed problem is unique, an error bound obtained on the whole class of well-posedness roughens to a great extent the true error bound. In the present paper, we study the difference between error bounds on the class of well-posedness and error bounds at a point for a special class of ill-posed problems. Assuming that the exact solution is a piecewise smooth function, we prove that an error bound at a point is infinitely smaller than the exact bound on the class of well-posedness. Original Russian Text © V.P. 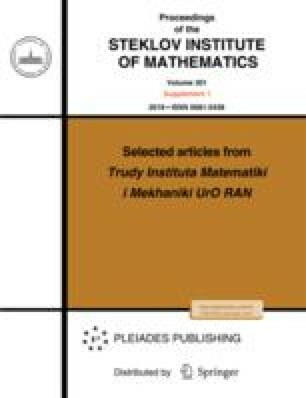 Tanana, 2017, published in Trudy Instituta Matematiki i Mekhaniki UrO RAN, 2017, Vol. 23, No. 2, pp. 230–238.